I am so excited, and I have to admit a little nervous, hope I made the right choice....so here is my dress! This is for PLUS SIZED WOMEN!! you don't look plus sized at all!! That dress is beautiful! I think you look absolutely lovely! Love it! Fits you perfectly! Thanks! And yes definately plus size.The sample is size 22 and is pretty close to my size. Beautiful Plus Size wedding dress!!! Suit for you! No way in a million years would I have guessed that. I tempted to call you a liar. You wear that dress well! JaonE2012 Thanks, you made my day :-). 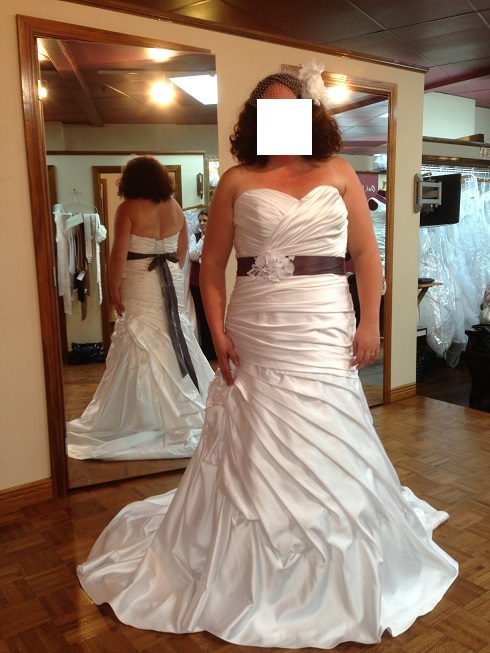 I wear size 16-18 in street clothes, so kind of discuriging to have a size 22 wedding dress, but it does flater me and make my silhouette look great, so that's whats important!!! !